This document deals with the still unsolved issue of proper rehabilitation of uranium mine sites after closing down operations. Namibia has large uranium deposits, many of them located in national parks of the Namib desert. It is therefore the Namibian challenge to find solutions in terms of how nature conservation and future and present mining and exploration can coexist while meeting the requirements of sustainable development. It is against this backdrop that the Namibian government earmarked the issue of rehabilitation as one of the most pressing and is currently in the process of updating the relevant legislation in order to establish adequate laws and regulations that are applicable to mine closure. This report aims to contribute to the ongoing discourse among political decision makers, scientists and in public, analyzing the current status and providing recommendations tailored to the Namibian situation. This evaluation is prepared in the framework of the EJOLT project. It familiarizes the reader in chapter one and two with the issue of uranium mining in Namibia and the importance and difficulties of rehabilitation after closing down operations. Chapter 3 introduces the rudimentary legal framework and Chapter 4 describes the currently used tools of self-regulation of the mining industry, which are meant to substitute the legal framework in the meantime. Chapter 5 describes the actions already undertaken by the Namibian regulator to overcome the situation of self regulation of the mining industry, while Chapter 6 focuses on one of the obstacles to this task – the different perceptions about rehabilitation among stakeholders. Chapter 7 provides a detailed analysis of the constraints in successful rehabilitation. Chapter 8 concludes with some practical suggestions and recommendations, based on comparative observations and experiences made in other jurisdictions. Natalie A. Renkhoff. 2015. 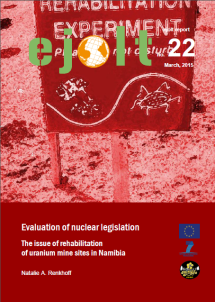 Evaluation of Nuclear Legislation: The issue of rehabilitation of uranium mine sites in Namibia. EJOLT report 22, 50 p.